Jess Bentley’s husband is murdered the night they return from their honeymoon. Soon she discovers that she is pregnant, and married to the murderer’s brother to protect the baby from her vengeful father-in-law. There’s nothing like finding a letter on your breakfast table informing you that you have a teenage son you knew nothing about. That’s what happens to international rock star Jon Stone. Jon drops everything to find the boy–and the boy’s mother, the girl he loved so many years ago. She left Jon when his rock ‘n’ roll life became too much for her to bear. Seeing her is like falling in love all over again. Everything seems perfect–until someone sets out to destroy their idyllic life. 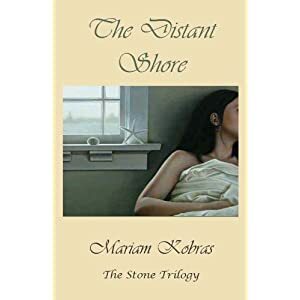 This entry was posted in Novels, Reading and tagged Amazon, Budapuss, Kristy K. James, Mariam Kobras, novels, SJ Driscoll, Smashwords, The Daddy Pact, The Distant Shore, The Stone Trilogy on December 7, 2011 by sallyjanedriscoll. Thank you for writing, Mariam! “There’s nothing like finding a letter on your breakfast table informing you that you have a teenage son you knew nothing about.” Guess I should open notes on my table with caution! 😉 Both sound like intriguing tales… Thanks, SJ! I wonder how many men keep that nightmare possibility in the back of their mind: that they may have a child they don’t know about. Here’s wishing you success with this novel and many others.